Come and join the fun at Environmental Nature Center’s 11th Annual Spring Faire and Butterfly House Opening! This day’s events if filled with enviromental fun, music and food the entire family will enjoy. 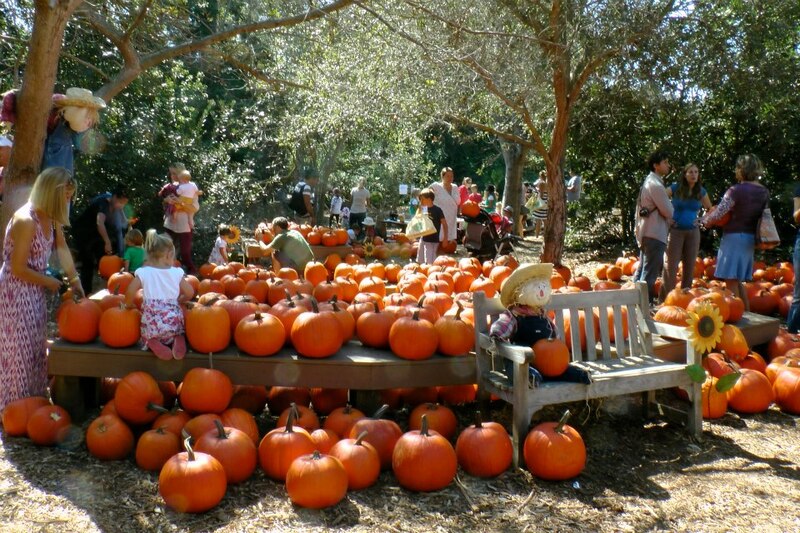 This is one of our favorite places to visit in Orange County! During the Spring Faire you’ll be able to to visit Orange County’s only butterfly house, view the Youth Art Exhibit, Purchase native plants that attract butterflies and birds to your own yard, Decorate your body with face paint or henna, Get a massage from the nice folks from Greet the Day! Play nature games, and see a live Bird of Prey presentation from the OC Bird of Prey Center. Gather ’round the Fire Circle Stage and listen to the Youth Singers of Orange County. Watch a live Bird of Prey presentation from the Orange County Bird of Prey Center, and so much more! For the kids – the purchase of a re-usable ENC canvas bag for $5.00 per child is your “ticket” for a full day’s worth of awesome crafts! 1:15 – Save the Queen Green! Come to Environmental Nature Center as Wolf Haven presents “Living with Coyotes”. 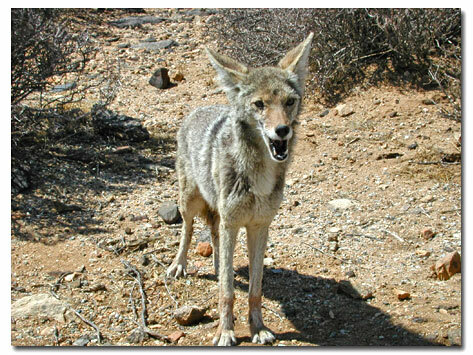 Unlike most wildlife, coyotes have adapted to living among humans. Skie Bender of Wolf Haven International will present a family friendly educational program about coyote behavior and biology. She’ll explain how coyotes can be beneficial, and how to protect your pets from predation by these intelligent creatures. Why are coyotes so important to an ecosystem? How can humans coexist with these amazing predators that share with us complex social behaviors and an adaptable lifestyle? The program will discuss the differences and similarities between coyotes and wolves. Skie will also give us an update on the Shasta Pack – California’s first established wolf pack in nearly 100-years! Wolf Haven International, a nonprofit sanctuary for captive-born wolves, Wolf Haven is located in the small farming community of Tenino, WA (about 1.5 hours south of Seattle). Pre-registration is required. Looking for some unique gifts for Christmas? Environmental Nature Center is giving you the most awesome opportunity to get some shopping done while walking the family friendly trails, enjoy some music and attend a few workshops at their Artisan Marketplace. Only ENC would give you the chance to walk their gorgeous trails while you shop for handmade gifts from 50 local artisans offering a variety of eco-friendly, sustainable, arts and crafts. If you work up an appetite grab some food from one of the food vendors. Your friends and family will love that you cared enough about them to think about their planet when you purchased their unique gift. Be a positive part of the local economy! Spend an evening at the Environmental Nature Center for a family Drumming Circle. As the sun is setting, come and gather around the campfire while surrounding yourself with trees and living things, listen to the sounds of daytime as nature is going to sleep and the nocturnal denizens of the Nature Center awake. As the stars begin to appear in the night sky the campfire will be lit and the drumming will begin. The Drumming Circle is a fun entry-level learning experience that is accessible to anyone who wants to participate. Drum Circle participants express themselves collectively by using percussion to create a musical song together while having a great time. Dancers are welcome too! Join facilitator Laurene Keane who will be providing drums for those who don’t have one. Cocoa will be provided, but bring your own reusable mug. Register online. Spring Faire is almost here! We are just one week away for Environmental Nature Center’s Spring Faire & Butterfly House Opening! Come to ENC for the 10th Annual Spring Faire and Butterfly House Opening Sunday, May 3, 2015; 10:00 AM – 3:00 PM. View the Children’s Art Show, enjoy delicious food from local restaurants and visit Orange County’s only butterfly house! There is also a native plants sale that will take place with plenty of plants that will attract butterflies and birds to your yard. If you purchase a re-usable ENC canvas bag for $5 it serves as your “ticket” to make some earth friendly crafts! You can also decorate your body with face paint or henna and dont’ miss getting a massage from the nice folks from Greet the Day! Kids can play nature games, attend “Story Time”, see a live Bird of Prey presentation from the OC Bird of Prey Center, and learn more about wolves from Wolf Totem Ambassadors! Check out pictures from last year’s Spring Faire! Children, ages 4 – 18 will have the opportunity to exhibit their art at the Spring Faire! The theme is “Wildlife of the OC”. Prizes will be awarded to 1st, 2nd, and 3rd place winners in four age categories. Prizes provided by Art Supply Warehouse, Susie Cakes, Bruxie Waffles, and the ENC’s Nature’s Gifts store. Enjoy the best beverages and food OC has to offer from local restaurants like Kean Coffee, Native Foods, Sensitive Sweets, Pie-Not, Veronicakes, Mi Casa, Avanti Café, Jay’s Catering, Which Wich, Bristol Farms, 24 Carrots, Vivo Events and the Alley. Learn more on our Savor OC page. Email us if you’re a restaurateur that would like to participate. Orange County’s only butterfly house will re-open on May 3! Come check out Orange County native butterflies and the plants they depend on to live. Host plants are munched by caterpillars; nectar plants provide nectar to the adult butterflies. Are you ready to SAVE MONEY on water and landscape maintenance? Whether your goal is to draw more butterflies or birds to your yard, save water, reduce pesticide use, or showcase color throughout the year, native plants can help! We’ll have nativemilkweed, beach aster,yarrow, seaside daisy,monkey flower, coast sunflower, white sageand more! Participate in a variety of fun games and crafts! Purchase a re-usable ENC canvas bag for $5 – your “ticket” to make awesome crafts like tie dyed butterflies, “stained glass” spinners, “egg-odes”, cocoon necklaces, springy spirals, and bubble makers. We’ll also have a “decorate-your-bag” station as well as a recycled fashion show photo booth! Visit the Spring Faire and decorate your body! Our face painters will be on hand to paint butterflies and caterpillars on your face, while our henna artists create beautiful designs on hands and feet. All fees benefit our environmental education programs. Gather ’round the Fire Circle Stage and sing along with Birdsong and the Eco-Wonders and listen to the Young Singers of Orange County. Students fromCommunity Roots Academy will be on hand to read a spring themed book that they wrote themselves. Watch a live Bird of PreyPresentation, and learn all about wolves fromWolf Totem Ambassadors. Check the schedule HERE. Live hawks and owls from the OC Bird of Prey Center will be on display. Wolf Totem Ambassadors will be on hand with their ambassador wolves. OC Reptile Rescue will be on hand with a variety of amazing reptiles and invertebrates.Francisco the Bug Guy will have tarantulas, stick bugs, scorpions, madagascar cockroaches, and centipedes! Save the Date for this event, it’s almost time for Environmental Nature Center’s Spring Faire & Butterfly House Opening! The splendid event takes places on May 3, 2015; 10:00 AM – 3:00 PM. Come and join the fun at the 10th Annual Spring Faire and Butterfly House Opening! View the Children’s Art Show. Enjoy delicious food from local restaurants. Visit Orange County’s only butterfly house. Purchase native plants and attract butterflies and birds to your own yard. Purchase a re-usable ENC canvas bag for $5 – your “ticket” to make awesome crafts! Decorate your body with face paint or henna. Get a massage from the nice folks from Greet the Day! Play nature games, attend “Story Time”, see a live Bird of Prey presentation from the OC Bird of Prey Center, and learn more about wolves from Wolf Totem Ambassadors! Youth, ages 4 – 18 can exhibit their art at the ENC’s Spring Faire on May 3, 2015! This is a wonderful chance for youth to create art with the theme “Trashy Yet Classy”. 2D and 3D art reflective of how the trash used in the piece affects the subject matter is encouraged. All participants will receive a ribbon for entering. Art must either be painted on trash or created from trash. Trash must be cleaned prior to being used in exhibit. Upon drop-off of artwork, a simple form with the artist name, name of artwork, medium, and phone number will be filled out and taped to the back of the piece. You may download and fill out forms ahead of time or fill them out while dropping off art pieces. Please do not attach forms to artwork until you are instructed to at drop off. With the exclusion of film, all mediums/sizes accepted as long as it can fit through the doorwa. PRIZES: A list of prizes will be posted online as the event draws nearer. Winners will be announced at the Spring Faire on May 3, 2015. 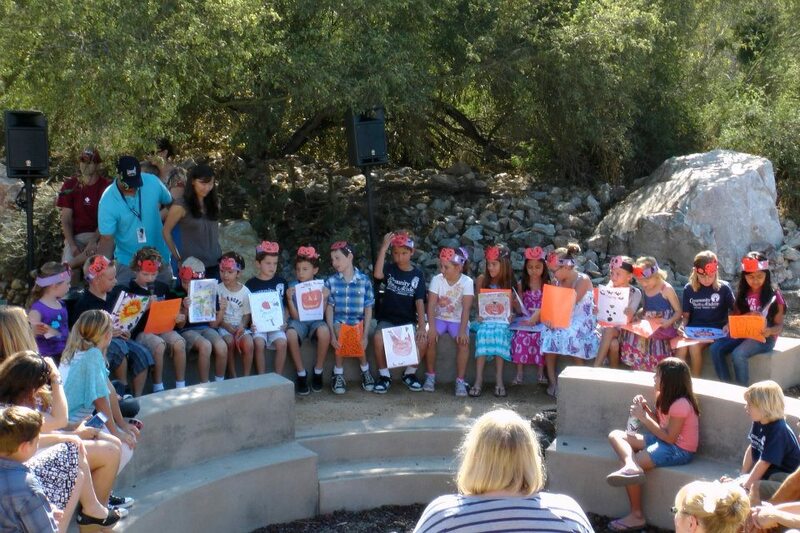 The first Sunday of the month at San Elijo Lagoon Nature Center is family fun day. Get closer to nature with hands-on activities and discovery walks. Spring is in the air and the lagoon is abuzz. Interactive activities and crafts will give kids a memorable hands-on experience. Learn if all snakes lay eggs, why flowers and pollinators need each other, among many other natural “mysteries” revealed. Sunday, April 5 – SCURRY, SLITHER & SLIDE: Did you know during cold winter months some reptiles go into a dormant sleep-like state (similar to hibernation) called brumation? Get an up close look at our reptiles as they wake up for spring time. Learn whether or not all snakes and lizards lay eggs, and make a fun reptile theme craft. Sunday, May 3- WHAT’S THE BUZZ: Flowers are blooming. Bugs are buzzing over spring time. Visit the lagoon to discover why flowers and pollinators need each other. In honor of Mother’s Day kids will make a special craft to take home for mom. Family Fun Days are presented by: San Elijo Lagoon Conservancy and San Diego County Parks & Recreation. Nature-themed monthly programs are part of TRACK Trails: Kids in Parks. The monthly program is part of TRACK Trails: Kids in Parks. Kids in Parks provides a national network of family-friendly trails, called TRACK Trails, that encourages visitation of public lands to reconnect our nation’s youth with nature, for their health, and the health of our parks. Each TRACK Trail has a series of brochure-led self-guided adventures designed to turn an ordinary hike into a fun-filled adventure. Kids can earn PRIZES for TRACKing their TRACK Trail adventures in their online nature journal, by logging in at Kids in Parks.